Kobèna Aquaa-Harrison is an award-winning producer, multi-instrumentalist and composer originally from Ghana. He is widely recognized as a performer, producer and creative force in radio, TV, film, dance and theatre. Whether performing at corporate events; working behind the scenes as the musical voice of CBC FIFA World Cup 2010; as a President/Artistic Director of AfroFest; or poster boy for West Queen West arts and entertainment triangle on billboards and 4 million print copies, Kobe’s contribution to culture is diverse and immense. An intuitive synergist of art and business ideas, Aquaa-Harrison started his first business at age ten breeding tropical fish; then at twelve, interior, home and graphic design; building and playing electric guitars at age fifteen. By age 20 he was working in Malawi as an architectural draughtsman, and at 22 became a prime-time Toronto radio host and journalist. Kobè’s eclectic creativity and marketing intuition is the secret spice of his commercial work for TSN, Nelvana, Nabob, Coca Cola, ITT, Bell, Kodak, BC Tel, Genie Awards ‘98, Kellogg’s, Molson, Bank of Texas, CIBC, Zantac, Freedom 55 and many more. Kobè is a ‘performer of choice,’ a dynamic collaborator and visceral accompanist. He is also a creative consultant to international artists, producers and organizations, most recently co-developing African Music Week and the Afrobeat Festival in Toronto with AIM2Impact (NFP). This former CKLN FM radio host, arts organizer and festival founder is considered a “visionary resource”, committed to social transformation through arts. He envisions goals and scores from many angles. Kobè performs for audiences as diverse as Lincoln Alexander, Prince Andrew, Alicia Keys, Romeo Dallaire, President & Prime Minister of Guyana, special needs and hospitalized children, charities and TV. Kobè has taught over 10,000 people of all ages the wonder of African hand drumming. Kobèna is currently Cultural Development Director at Abandze Embassy. His all-star band, Djungle Bouti Orchestra, has featured an astonishing “who’s who” in Canadian talent and their ground-breaking new CD “Djazz 2.1.4.” is eclectic, soulful, acclaimed as “an audio decoding of African DNA” applauded by artists like Habib Koite and Mighty Popo. 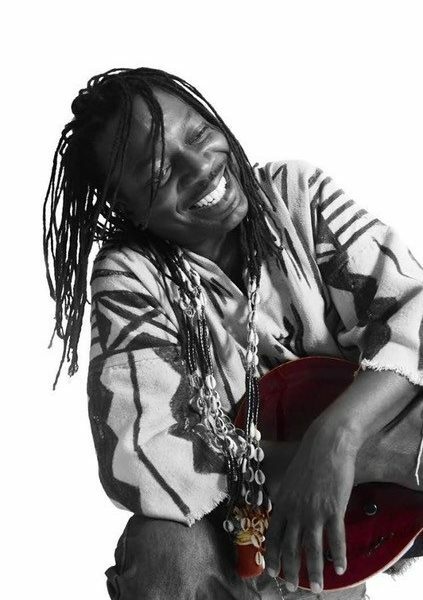 Traditional African instruments, MIDI-guitars and a digital kitchen sink are his tools as a soloist or when working with Andrew Craig, Zap Mama, Divine Brown, Deborah Cox, Alicia Keys, Bass Is Base, Jackie Richardson, Wunmi and Kelly Lee Evans among others. Both Jully Black and Lady Gaga’s guitarists have performed with him.